GRANDPA AND JESUS AND PODUNK! Celebrated author Richard Paul Evans writes, “There are two kinds of people in this world. There are those who climb mountains and then there are those who are content to sit in the shadows of the mountains only to critique the climbers.” And while that statement is so very true, I genuinely feel bad for those who will never hear the music of the mountaintops because they have allowed some bozo who probably doesn’t even own a pair of hiking boots to talk them out of even trying! Are you becoming so sensible that you are actually ignoring the very senses that call you to experience something that could very well be sensational? It astounds me how many people make fun of faith but have never even ventured to explore it to its fullest. I have a very strong word of caution for crowds like that! Don’t be dismissing something that you choose to stay in the dark about. You can’t be intelligent if you deliberately choose to stay ignorant. Everything that Jesus did, he always chose to do it right smack dab in the broad daylight. But the critics of his day only saw him as nothing more than Joseph and Mary’s son, the carpenter from Nazareth. They could not and would not even consider his claims because they were tied down by their own biased prejudice. Isn’t it funny that ones that Jesus touched the most were the ones that most of society wasn’t that crazy about touching it at all? The lepers and the beggars and the cheaters and the prostitutes were willing to follow the yearnings of their souls to get a glimpse of life from a whole new level of looking! The people who traversed up Mount Faith knew Jesus to be so much more than the so-called religious leaders of the day knew. The critics said about Jesus, “We don’t like what we see.” The sinners said to the critics, “Don’t you wish you did? Don’t you wish you could?” It is nonsense to not have the good sense to see if Jesus makes sense to you for yourself! My Dad would have been 79 years old on April 29th of this year. He died 11 years ago. His father, John Sheptock died 50 years ago when I was a baby of a little over a year old. My Grandfather was a coal miner from West Virginia who migrated to Shamokin, Pennsylvania and eventually to Clifton, New Jersey where he spent the latter part of his life working for the Erie Lackawanna Railroad. I never really knew the man although my senses were always stirred when I would hear stories told about him. And for most of my siblings, the stories were enough- but not for me. I wanted to know him more. But how could I be close to a man that had been gone for so long? I had the good sense to make sense of who John Sheptock really was! I began asking those who had spent time with him like my Uncle Johnny and my cousin Herb to tell me everything they could about him. I began to hunger for more and more information! They shared that Grandpa was a strong hard working family man who while not overly emotional- communicated clearly through his actions the genuine love that he had for his family. They also told me the bad news that he was a devoted Yankees fan which didn’t exactly endear me to the man- but not every Sheptock could be perfect in every way! My Dad was a big Brooklyn Dodgers fan who could never give his allegiance to the dreaded Yanks when the Dodgers left for Los Angeles. He waited around until 1962 when the Amazing Mets were born! My Grandfather was already gone by ‘62 before he would get a chance to truly see the light! Anyway, even those thoughts made me laugh and only imagine the discussions we could have had about baseball and such. As for John Sheptock’s profession, a couple of years ago when my son Rudy and I were visiting out in Western Pennsylvania- we came upon an old coal mine that featured guided tours. Needless to say, we were the only ones who showed up for the experience that day and with the help of a retired miner named Joe, we got the one on one attention that many students could only dream of! He gave us more information than any one brain could hope to contain about coalmining! 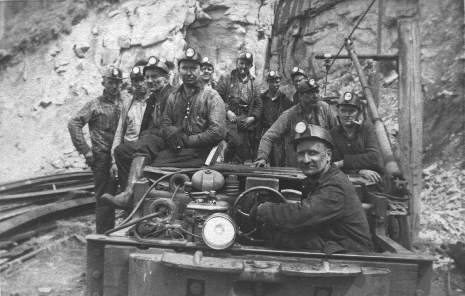 He had us in the pit of the mine, in very close and much too tight for me quarters and in the pitch dark and it made me wonder how Grandpa could do this every day for so many hours faithfully for his family! 2 Rudy’s and a Joe and it was fascinating and it made me understand the man that up until then, I really never did know! And I left that roadside attraction feeling unusually close to my Grandpa! And the reason was so simple. It was because I was willing to go to where he worked and be where he had spent so much of his life and to see what he saw and feel what he felt. I got to process life through his viewfinder. And I began to love John Sheptock anew. A man I hardly knew- I now was coming to know, because I now was willing to grow in my knowledge of him! Have you ever used the place called “Podunk,” in a phrase that you were using? Did you know that Podunk literally means, “The place where the foot sets in?” I went to Podunk to allow my feet and my heart and my soul to set in to get acquainted with a man that was an essential part of me- I just didn’t know how much. How far are you willing to go to get to know Jesus? Are you willing to listen to the tales of others who have come to know him so well? Are you open to going to the places that he would have walked and actually do some of the things that he would do? If you are- chances are real good that your impressions of him might just “set in” deeper than they presently are! But it is up to you! I dare you to move! I dare you to be aggressive in your adventure and passionate in your pursuit. It will make all the difference in you just knowing about the man- and you actually knowing the one that said he was the way and the truth and the life!